On the 3rd of January 2009, Cagayan de Oro's New Year was met with tragedy as tropical depression "Auring" devastated the city with flash floods. This has shocked thousands of Kagay-anons as this has never happened in our beloved city before. The areas of Macasandig and Carmen have our neighbors evacuated. They need all the help they can get - their homes are either filled with waist-to-head level of water or are totally destroyed. Food may be scarce since nobody was prepared for this. PLEASE HELP IN ANY WAY. On January 11, 2009, another flood has ravaged CDO. This time, the areas of NHA, RER, Kauswagan, Iponan, Bulua, Canitoan, Lapasan, Macasandig, and neighboring towns Alubijid, Opol and cities of El Salvador, Iligan, Gingoog are affected. The floods caused structural damages on bridges and roads and houses; landslides; and lives. 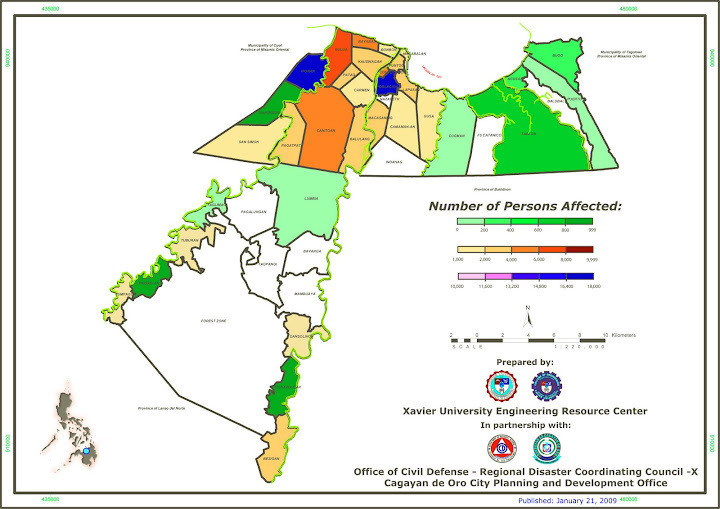 This is the CDO Damage Impact Map taken from the recent floods in the city by the XU Engineering Resource Center (headed by Engr. Dexter Lo). The REGIONAL DISASTER COORDINATING COUNCIL of Region 10 issued this Progressive Report as of January 12, 2009, 07:00 PM. The calamities that Cagayan de Oro suffered from two floods that hit the city within a week from last January 3 to January 11, 2009 are far from over. On the night of Jan. 13, Tuesday, more rain poured in the city and in neighboring towns in Bukidnon, causing theCDO and Iponan rivers to overflow and flood waters to rise again. As of January 14, 2009, in Cagayan de Oro, the number of barangays hit rose to 44, with about 15,000 affected families. Other areas, affected are 13 barangays in Gingoog City; 4 barangays in Oroquieta City; and one barangay in Iligan City, and 15 municipalities of Misamis Oriental. Landslides also occurred in the upland barangays of Taglimao, Pigsag-an, Tuburan and Tumpagon, in San Simon, Iponan, Lapasan, Gusa, Balubal, Camaman-an and in Macanhan, Carmen, in the city of CDO. Xavier University, through the Kristohanong Katilingban sa Pagpakabana—Social Involvement Office (KKP-SIO), is responding with relief operations. Cash and goods donations are most welcome. Displaced families are in need of food items, rice, beddings and blankets, clothes and slippers for toddlers and adults, baby diapers, male and female underwear both for children and adult, bath and bar soaps, can opener, utensils for cooking. Those who would like to help can send donations to the KKP-SIO, 1/f Aggie Building, Xavier University. Telephone number: (088) 858-3116 local 3210 and 3215. Deposit to: Xavier University, Account Number 933-101-3363, BPI. Please inform KKP-SIO of any deposit made, to enable monitoring. fritz`, thanks much for posting this so more people can work with us-- this is all our fight! i'm saddened with this. have a similar post..
Nobody else has done a better compilation of everything we need to know and see. Very good job, ding. To Ate: Thanks Te, although I merely posted stuff that people have worked on. In a way, this is also my way of saying thank you to the volunteers who put so much effort for information and relief dissemination. To Sir Dex: OK Sir, I updated the post regarding the map (I totally forgot that this is still not final). This is a interesting topic and I actually ran across a blog , link below, where they are exposing a CDO based foreign bugaw, named Michael Mountstephen, who claims to have political protection in CDO to carry out his vile acts of exploitation. The interesting thing is the blog uses Michael Mountstephens own words to paint a picture of the situation. I highly advise all to view it as its quite enlightening.